While I'm Waiting...: Waiting on...Halloween! I love the holidays - doesn't matter which one! I love them all! I would love to tell you that I just LOVE decorating for them but, sadly, I don't. Not because I don't appreciate beautifully decorated homes - it's just that, well...I completely stink at it! Not to mention that I didn't really pay attention when we bought our house but there are really no available horizontal spaces to decorate! Kind of makes things hard. But, no sense in talking about what I can't do - let's talk about what I can! I love to craft! I'll see something and think to myself, "I can make that!". Here are a few things I've been working on while waiting on Halloween! One of my most favorite things to do is to leave little surprises on doorsteps. I know how crazy excited my crew gets when we've been blessed this way so it's always fun to keep it going! Here is a little something I put together this year! I found this cute monster paint can at Wal-Mart! The glow-in-the-dark gloves were found in the dollar section at Target and the glow-in-the-dark silly string came from Michael's. You might remember this frame from my hubby's birthday week. You can read more here. I think it looks MUCH better zoomed in! 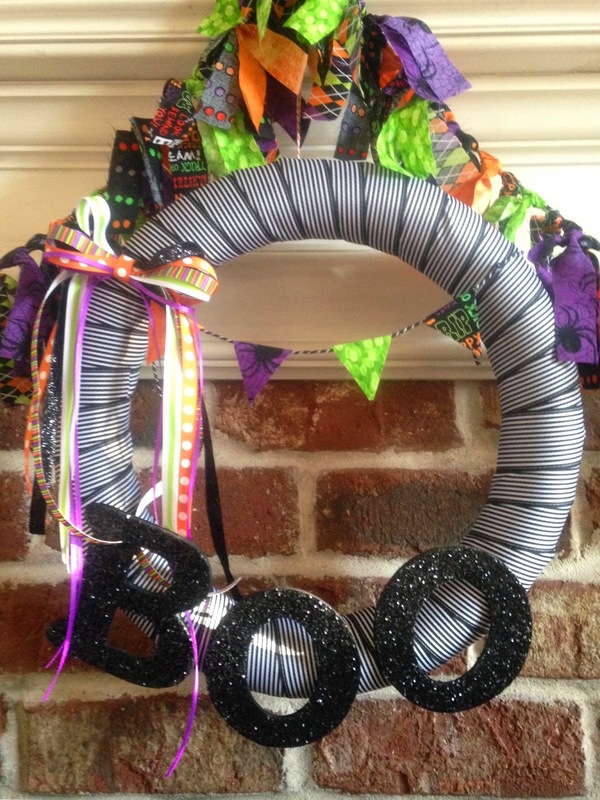 My sweet friend, Susan, made the adorable fabric garland and wreath! Thank you, Susan! I'm a sucker for kid's artwork and will display as much as I can. Here are a couple of Hope's spooky creations! 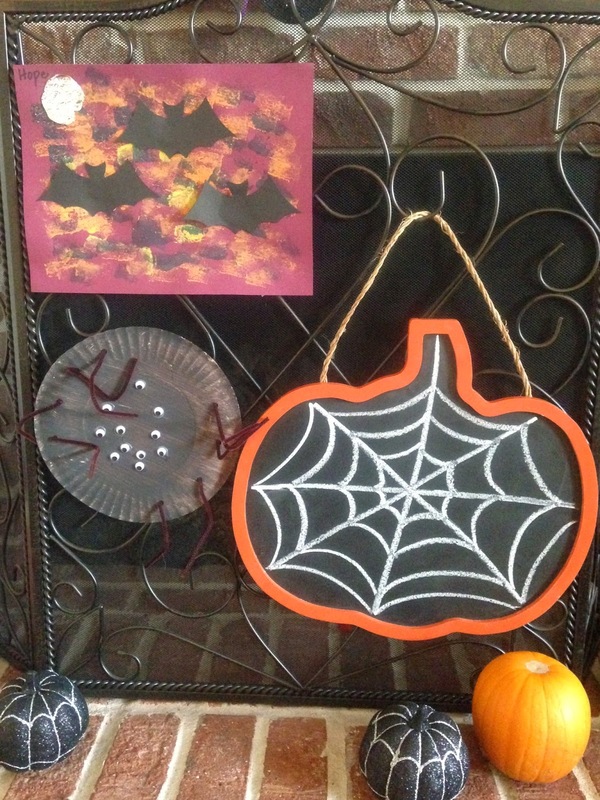 And, the adorable chalkboard pumpkin came from Kirkland's! Just noticed it's on temporary sale for $7.49! Hurry and get one before it's too late! 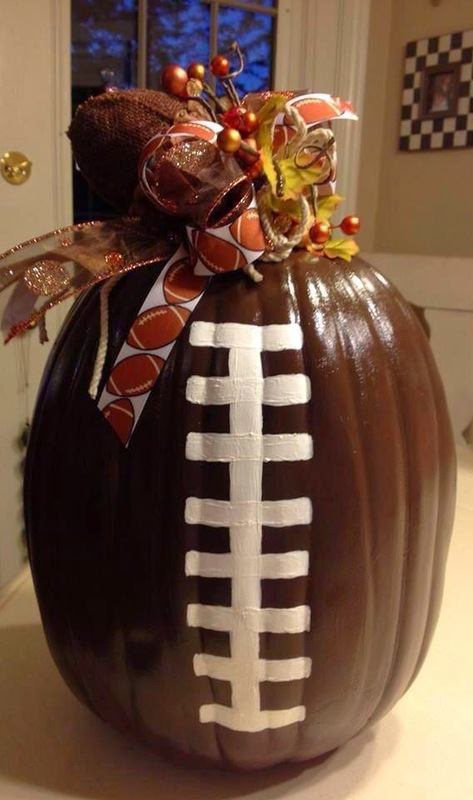 Saw this football pumpkin and knew I had to make one too! Last year I saw this cute pumpkin and, of course, had to make it too! 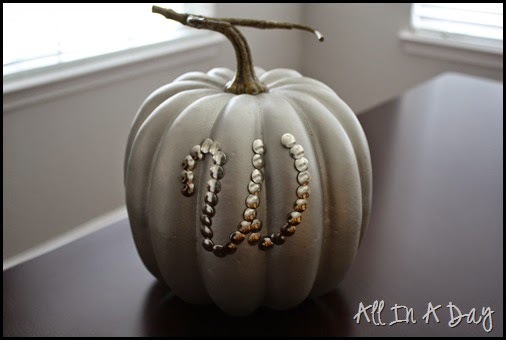 Amy at All In a Day shows you the how to on her blog! Thanks, Amy! I LOVE this! My dear friend, Shelly, gave me this with a festive bottle of vino. She shows you how easy this is to make on this post. 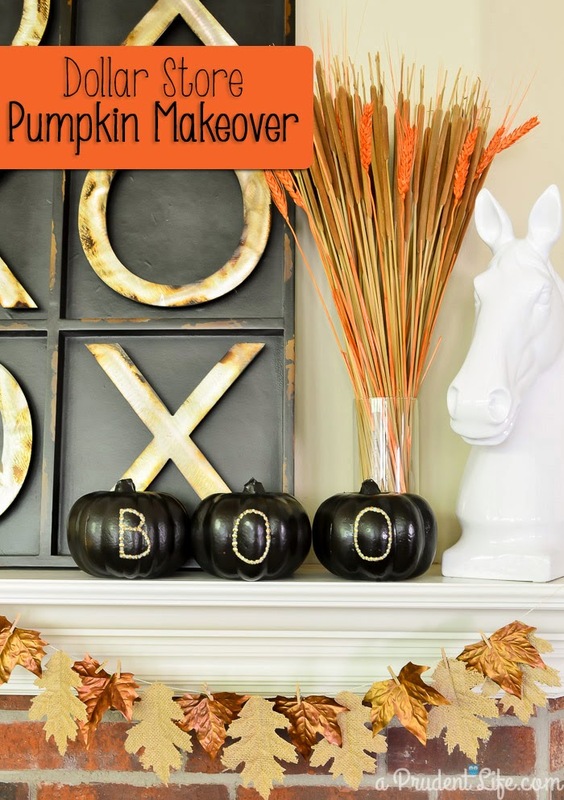 I just HAD to check out this Dollar Tree pumpkin makeover - yes, it's as easy as Melissa says it is! Here are a couple of fun Halloween gifts I put together for the girls' teacher plus the Crossing Guard at Holden's school. I've noticed that I don't do as much for Colby's teachers anymore. :( Anyone have any good idea for middle school teacher gifts? He's got a lot of teachers so it must be economical and also for either male or female. Ready - set - suggest! Putting together little goodies for Hope's "pretty" school (she thinks when we say Pre-School that we are saying Pretty School) friends always bring me joy! Here are some little cauldrons of Halloween treats. And, just in case you are wondering where I keep all these treasures before delivery - check out my closet floor! But, I wouldn't have it any other way! 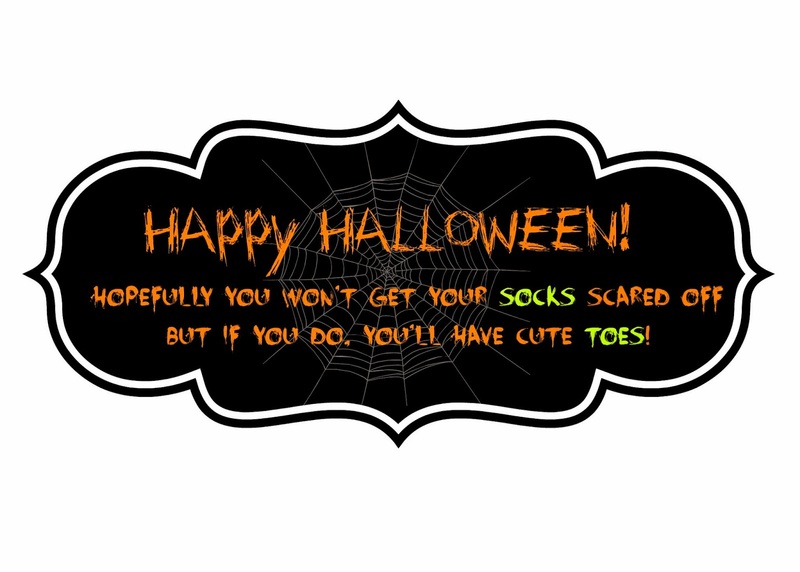 I hope you guys are having a great day and are eagerly WAITING on Halloween! We LOVED our boo basket! This is definitely your gift friend. And thanks for the shout out! Glad you guys liked it! I had fun putting them together! I love all your ideas! I have so much fun putting together little gifts for people. I was a little sad this year when my middle school daughter told me she really didn't want to give her teachers Halloween surprises. I guess teacher gifts end in jr high? Our school does lots of organized events like muffin mornings and lunches for the teachers so that makes me feel a little better about it. It's sad that the older our kiddos get the less they want us to do for their teachers. I feel these are the teachers that need the most love! They truly have a calling! I'll be sure to share if I come up with any fun gifts for them! Thanks for stopping by!